Women in the WASH sector: Is Being Invited to the Party Enough? Following 2018 elections in Ethiopia, a record-breaking number of women now hold leadership positions in the country’s government. But women still struggle to rise up the ranks in other sectors. 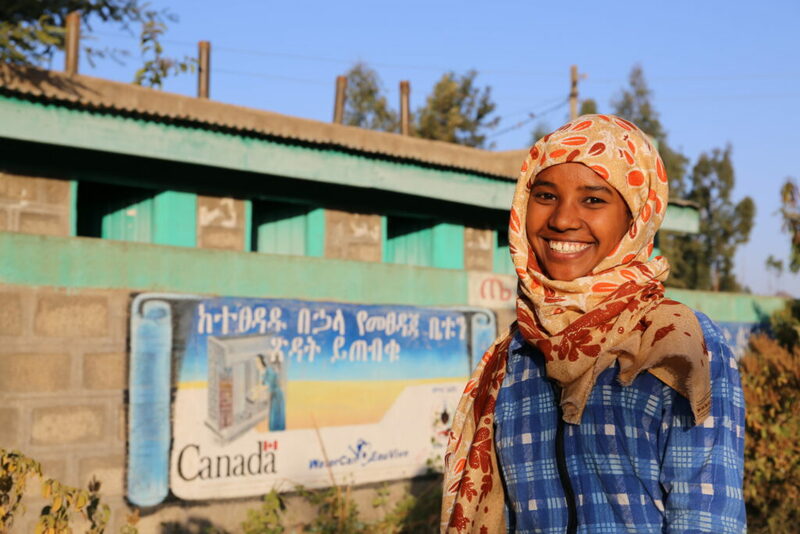 To mark International Women’s Day, WaterAid Ethiopia Country Director Bethlehem Mengistu shares lessons on being a female leader in the water, sanitation and hygiene sector. I am thrilled to witness the fantastic changes that have taken place in Ethiopia over the recent months, with women assuming leadership positions at the highest levels of government. The best part of this narrative is that little Ethiopian girls will now see a woman president or minister as the new ‘normal’, and no longer the exception. I find this quite inspiring! But in my field of work – the water, sanitation and hygiene (WASH) sector – we are yet to see a sensible percentage of women in leadership roles. The participation of women is most often seen in community water supply management frameworks, where women are included within the team that manages the water supply system. This is important as the intention is to sustain the benefits of the system by both genders, but also ensure both men and women are equally engaged. However at sector level (i.e. where policy, resourcing and planning are usually discussed and decided upon) there are very few female decision-makers. This is not an accurate response. There are qualified women out there, but we need a reform in the sector’s approach to reaching those women professionals. For example, organisations like CARE Ethiopia have achieved good results through reforming their entire recruitment process. CARE re-graded all their job descriptions, re-advertised positions 1 to 3 times if no women applied, head hunted, instituted a competency-based assessment system with written examination (coded so the panel does not see which applicant wrote it), and assessed and reconfigured the interview questions using a gender lens. This has brought the organization closer to meeting parity. I was and still am the youngest female in most sector meetings. For some time after I assumed the directorship, most assumed I was in admin or a support role rather than a leadership role (until I corrected them). It’s not enough to be in a role or to sit at the table. Speaking up confidently is critical (I have a colleague that is fond of the saying ‘fake it till you make it’). The greatest barrier that I and most of my female leader friends face in speaking up is fear of being ostracized or scorned – the dreaded ‘imposter syndrome’. I have learned that respect comes when one’s voice is heard. I have seen how our voices can help shape policy and perspective. I choose to ensure my presence is known as a leader and that it’s to be regarded as a contributor for good. Nearly three years into my current role as director, my voice is now sought after, and I can choose to be picky about how I collaborate with others. Trusting my voice by learning to control self-doubt was quite tasking, but I soon learnt to spot patterns of negative thought, identify them for what they were and train myself to trust my expertise. This led to speaking up more at meetings, ensuring I usually always sat at the front and participated. Celebrating unapologetically is not as easy as it sounds. I always found it interesting that many women in meetings, when introducing themselves, state their name and then their familial status while the men state their name and then their title. This is linked to the fact that the type of accomplishments that are given weight by society is what we sub consciously align ourselves with to garner acceptance. Finding a sisterhood to lift and celebrate one another has been paramount to my confidence. Given that most of the issues we face as women are partly similar, I find it very helpful to surround myself with women leaders who are on a similar journey and with similar moral values. One of my mentors is a woman whom I deeply admire, and she provides me with invaluable support. This post was written by Bethlehem Mengistu, Country Director of WaterAid Ethiopia. WaterAid, a 2019 GHC member, transforms lives by improving access to clean water, hygiene and sanitation in the world’s poorest communities. They work with local partners and influence decision-makers to maximize their impact. This post originally appeared on WaterAid’s blog.